Home > News > Form 3 & 4 > Does gas weigh anything? In our Spring term science topic, Forms 3 and 4 are researching states of matter. 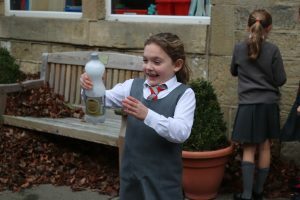 With Mr Laycock, we worked together to investigate the weight of a gas. We used the courtyard area to conduct our experiment. 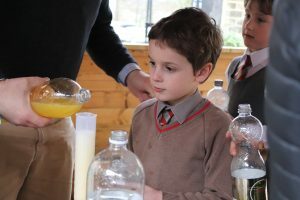 In groups of 4, we filled our bottles with either cola, lemonade or orangeade – drinks that are filled with carbon dioxide. We measured the weight of the drink and wrote down how much it weighed fizzy. Then came the fun bit! We shook the drink, up and down, shook it around until the drink was flat. We slowly unscrewed the cap to let bubbles escape then passed it on to our friend for them to screw the lid and shake some more. After lots of shaking, the drinks were flat and needed weighing again. A lot of us thought the weight would not change because gas is like air. However, the results showed that the drinks weighed LESS when the bubbles were removed, proving that gas does weigh! 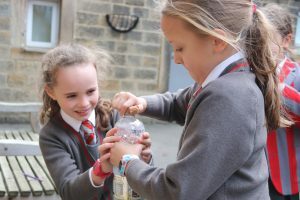 We have lots of exciting experiments coming up to explore the different states of matter including melting chocolate and looking at the changing states of water.